WEDNESDAY Sept 23rd 2:30-4:30 PM Koret Auditorium SF Public Library Main Branch 111 Larkin SF The Power of the Word: Fanzines and the Pioneering of Punk Rock Journalism, Join pioneering journalists for a panel on zines at the Koret Auditorium in the Main branch of the SF Public Library. 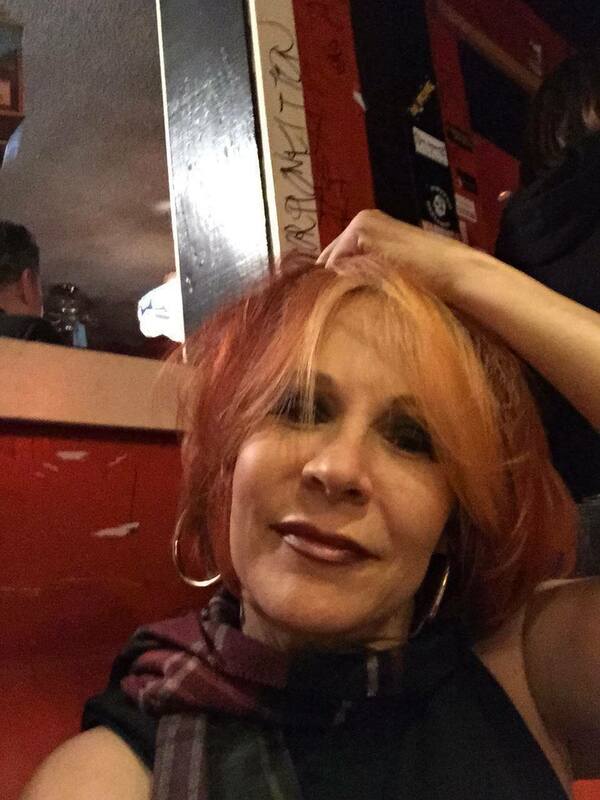 V. Vale, Mickey “Creep,” and Verna Wilson (of Ripper) will discuss their experiences as pioneers in the punk rock scene and examine the pivotal function of fanzines between the years 1975 – 1981. All Ages. Tampon Drive Donation Collection Site. WEDNESDAY 9/23 6:00 PM-12:00 AM Public Works 161 Erie St Opening Night Extravaganza. Tunnel Vision, the Punk Photography Exhibit, opens in the Roll Up Gallery and punk photography, flyers, art, and posters fill the balance of the space in this one night extravaganza! Check out the gallery show in the Roll Up Gallery (open 9/23-10/2), peruse the one day massive punk photography and art show hung throughout the venue, view rare punk films (including the recently unearthed Deaf Club films) dance to live music with Gimme Danger (Stooges Tribute band w/ members of Chrome and Thrill of the Pull) and pogo the night away with early era punk spun by our DJ extraordinaire Bryan James! 21+. Tampon Drive Donation Collection Site. Featured photographers include Sue Brisk, Joe Truck, Kamera Zie, Ruby Ray, Richard Alden Peterson, Vince Anton, George Sera, Erich Brogger, and Jack Jackson. THURSDAY 9/24th 1:00-10:00 PM THE ODD FELLOWS BUILDING 26 7th St SWAP AND SHARE AND PUNK PANELS. Punk Records, Punk Collectibles, Punk Books, Punk Flyers, and Zines Some are selling some are sharing their collections in this combination SWAP SHARE AND TELL. Peruse rare punk albums, books, art, buttons, zines, and flyers and talk with the people who are displaying and vending. Authors from Michael Stewart Foley and Marc Zegans to photographers Bobby Castro and Ruby Ray will be on hand to sign their books. Please donate at the door to the tampon drive. All Ages. Tampon Drive Donation Collection Site. “Punk: What went Wrong… and Right” Panelists: Val Vale, Jeff Bale, Denise Sullivan, Peter Urban. Moderated by Michael Stewart Foley, author of “Fresh Fruit for Rotting Vegetables” All Ages. Tampon Drive Donation Collection Site. 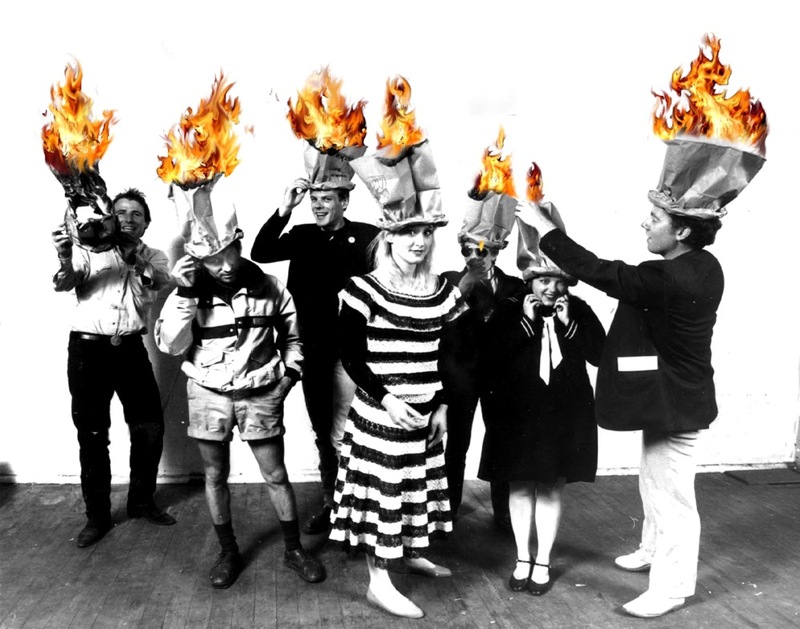 THURSDAY 9/24 TBA Walk into the Past Punk Walking Tours of the places, sites, and sounds of our youth. Join Eric Bradner on one of 4 scheduled narrated walking tours traveling back into the days of the first era. Friday 9/25 111 MINNA- ZAPPA ROOM 111 Minna SF 7:00 PM-12: 30 AM THE WILD, BEAUTIFUL, and ECLECTIC SIDE of PUNK featuring legendary first era punk artists and bands. San Francisco legends The Toiling Midgets return with their swirling guitar sounds after a two-year hiatus. LA based The Deadbeats w/ Geza X make their first ever Bay area appearance. Artistic genius Winston Tong (Tuxedo Moon) with Lx Rudis (The Units) make a rare appearance and the iconic Alice Bag returns to the Bay Area with a stunning reading and musical performance. Marc Zegans premiers his new book of poetry “ The Underwater Typewriter “Release date 9/25. Performance Artist Jeorgia Anderson and Spoken Word artist Jennifer Blowdryer mesmerize while L’Egregore rivets with their multimedia performance art. It’s a night of first era punk legends. 21 +. Tampon Drive Donation Collection Site. 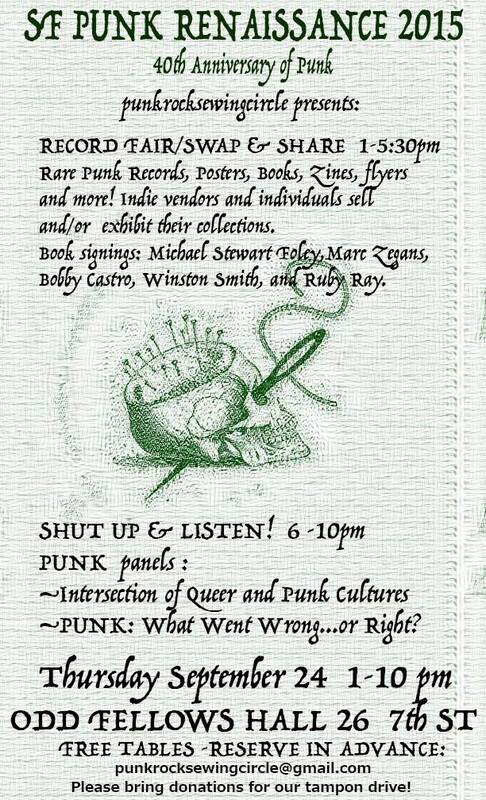 Authors: Patrick O’Neil (Gun, Needle and Spoon) and Michael Stewart Foley (Fresh Fruit For Rotting Vegetables) will be on hand to read and sign their recently released but soon to be punk classics! 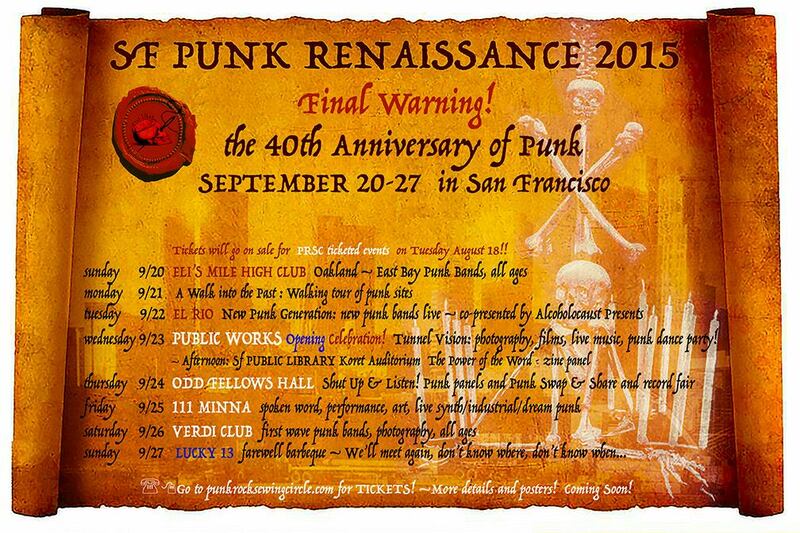 SF Punk Renaissance Saturday September 26 at the Verdi Club- It’s a Night of First Era Punk! On Saturday September 26th, Punk Rock Sewing Circle returns to the Verdi Club for an extended show of first era punk from 2:00-12:30 AM! For those who missed SF Punk Homecoming in 2013, the Verdi Club is a historic Italian American Social Club in Portrero Hill. Constructed in the 1920’s, this hall charms with the faded elegance of Old San Francisco. On Saturday, the walls will reverberate with the sounds of first era punk as we celebrate the 40th Anniversary of Punk Rock! 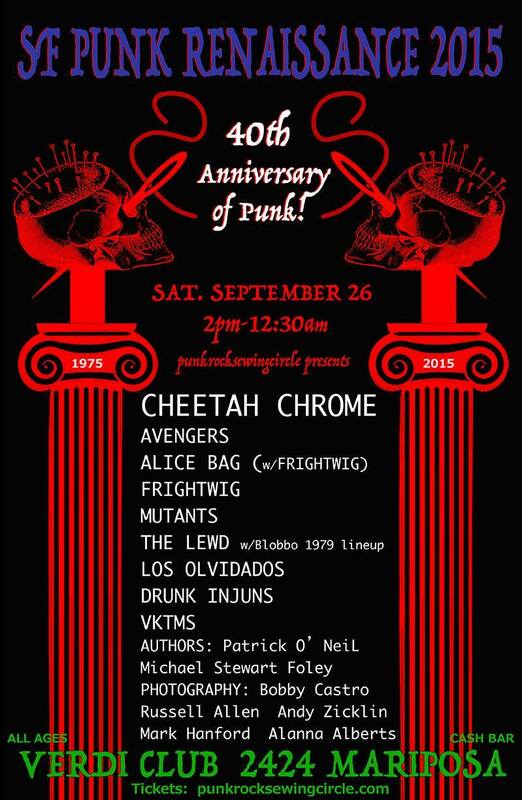 Former Dead Boy, Cheetah Chrome will headline this outstanding event in a rare appearance. The Mutants return with their first San Francisco show in over two years and The Avengers, San Francisco’s own punk legends, will take the stage with their classic punk anthems. 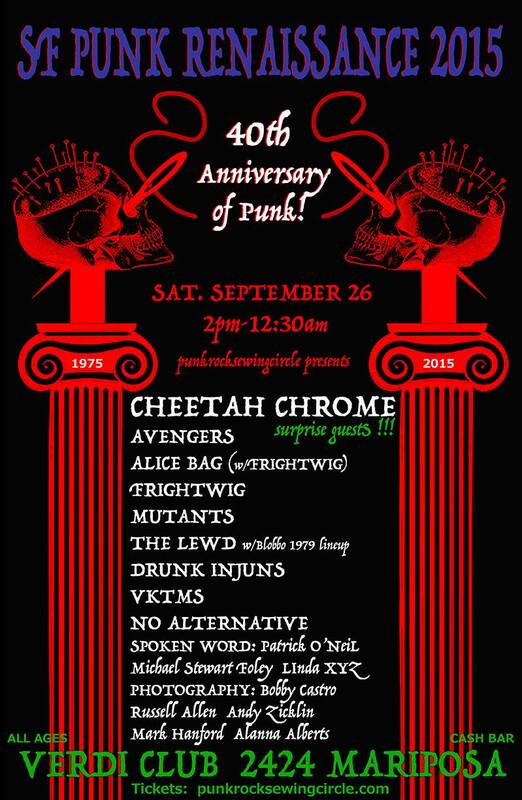 Alice Bag will make a long awaited return to San Francisco playing a special set of punk classics backed by our own Frightwig. Never fear if you are looking forward to “A Man’s Gotta Do..” Frightwig will also play a separate set of their original music. Seattle transplants, The Lewd, return with their original 1979 line up! South Bay legends Los Olvidados and The Drunk Injuns return after an absence of decades and our very own VKTMS open the musical proceedings. Writers Patrick O’Neil (Gun, Needle and Spoon) and Michael Stewart Foley (Fresh Fruit For Rotting Vegetables) will be on hand to read and sign their recently released but soon to be punk classics! Photographers Bobby Castro, Russell Allen, Mark Hanford, Alanna Alberts, and Andy Zicklin will exhibit their stunning photos of fans, bands, and memories on the historic walls of the Verdi Club! For those who are wondering how to eat and not miss any of the sets, never fear! The talented chefs of the Verdi Club will be on hand with some delectable creations. And for those with a sweet tooth, Frozen Kuhstard will be stopping by with their fantastically indulgent frozen custard; outstanding in its simplest form and better even still dressed up as an adult sundae. Join us in Celebrating the 40th Anniversary of Punk– it only comes around once in a lifetime! Oh yes, we almost forgot-we may have some very special guests dropping by ….